This article talks about 5 free websites to geotag photo online. Geotagging photo is the process of adding geographical identification to the metadata (EXIF) of the photo. 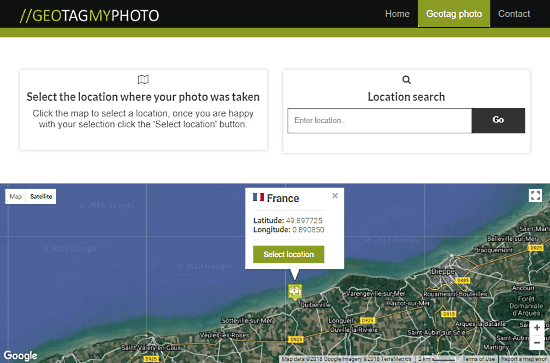 With these websites, you can easily add geographical coordinates to your photos. 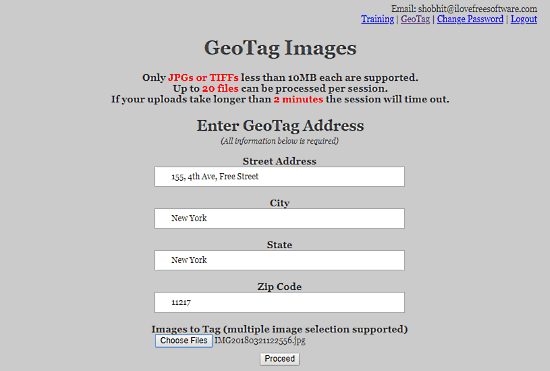 Some of these websites also let you replace the geodata in an already geotagged photo. After adding/replacing the geodata, you can download the geotagged photos to your computer. GeoImgr.com is a simple website to geotag photos online. You can upload your photo here and add geotags to it. You can also use this website to replace already existing geotags in a photo. The process of adding/replacing geotags is really simple. Here, you get a map-window to select the geographical coordinates. 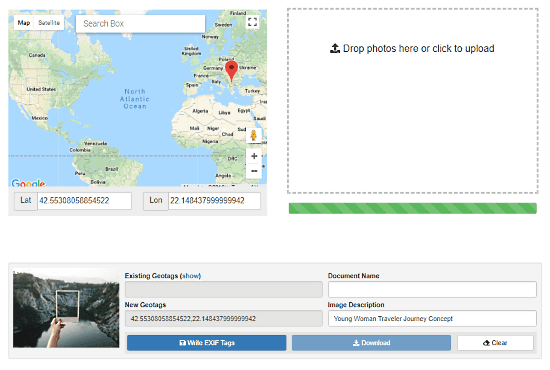 When you upload a photo, this tool reads the metadata and plots the geodata (if any) on the map. Now, you can change/add the geotags by selecting any desired location on the map. Apart from that, you can also add a description to your image, which will be saved in the metadata along with geotags. Geotag photo online with GeoImgr here. GeotagMyPhoto.com is another free website to geotag photo online. Here, you can add geotags to a photo in two simple steps. The first step is to upload your photo to which you want to add geotags. In the second step, it shows you Google Map, where you can double-click a particular location to add that to geotags. After adding the geotags, it shows you a preview of that location in both, map and satellite view along with a button to download the geotagged photo. Here is the link to geotag photo online with GeotagMyPhoto. With UrbanBird.io‘s online EXIF editor, you can easily geotag photo online. When you upload your photo to this EXIF editor, it gives you an option to edit the EXIF data of the photo. In the editor, you can choose an address on the map and select the local spot for the geotags. Along with the location, you can also add date and time at which the photo was taken to the EXIF data of the photo. 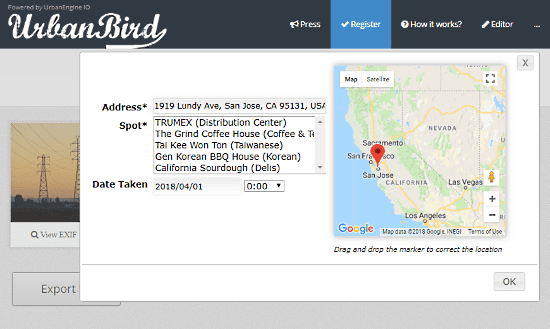 Geotag photo online with UrbanBird here. Geotag.online is an online tool to geotag photo online. Here, you can enter an address to add those geo-coordinates to your photo. The main feature of this tool is that you can geotag multiple photos simultaneously. You can upload up to 20 photos to add the same geotag to all of them in a single instance. After that, it will email you the link to download all the geotagged photos. Try this website to bulk geotag photos here. CSC-Search.com is a free online tool where you can tag location to your photos along with additional business-related information. People can use this tool to add their shops on the map. 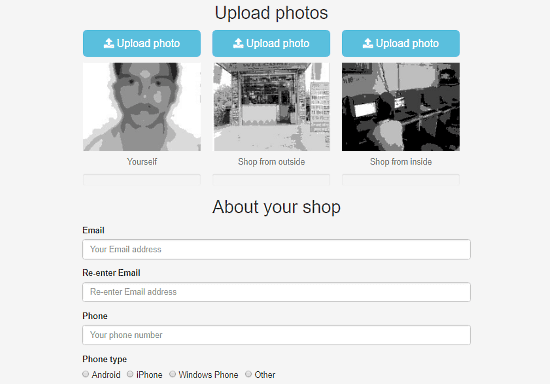 Here, you can upload photos of your shop along with a photo of yourself and add the location and other contact information to them. Once you do that, your shop will be listed on the map on this website and an email will be sent to your email address with a link to download your geotagged photos. Geotag photo online a try here. All these websites to geotag photo online are free and easy to use. You can use any of them to add or replace geotag in a photo.